This ongoing body of work explores the interactions between radiation and matter: whenever an electromagnetic radiation meets matter can occur different interaction phenomena. In particular, I found interesting the phenomena of optical diffusion and the light scattering, a wide class of phenomena in which waves or particles are deflected due to the collision with other particles, for its potential to generate some astonishing and unpredictable new trajectories. The project look for the wonder emerging at the intersection of science and art. Applying the principles of optical physics to a device composed of glass and a light source, something magical and unexpected happens: what is usually transparent produces shadows and reveals its inner structure. Light, like all electromagnetic waves, interacts with matter. The diffuse reflection from the surface, alone or combined with the absorption, is the primary mechanism by which objects are revealed to our eyes: the light allows us to see the world around us, the reality is revealed to our eyes thanks to this interaction. Therefore the relationship between these two entities is the basis of our visual perception, since it is due to the reflection or absorption of the electromagnetic waves, we make the experience of things and colors. Moreover moving the illuminating source it is possible to see different things from the same point of view. But have we seen it all? Much of what we can not see and that seems hidden, is really close to us. And what is transparent is not invisible. 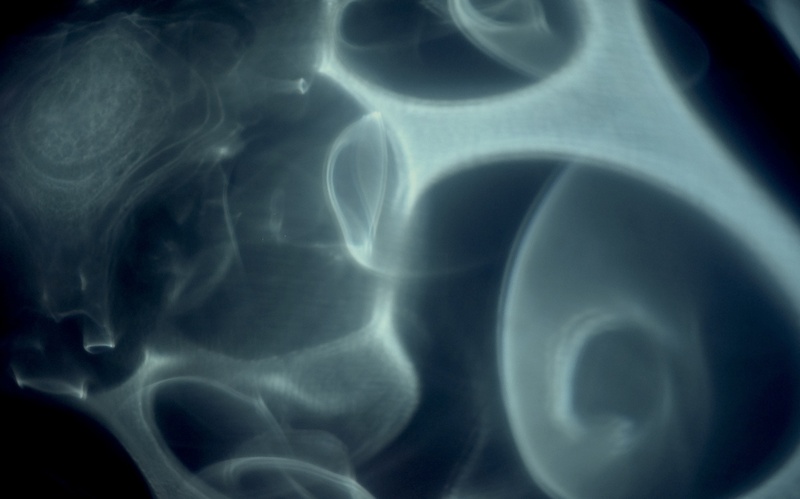 This empirical research explores the effect of diffusion through an amorphous material such as glass, discovering shapes hidden in the structure of transparent objects that normally is not visible. The glass may contain, reflect and refract light. Multiply and distort vision. For its characteristics is a kind of membrane, border, which can conceal and protect. It ‘a barrier between the outside world and the inner world, enclosed space and open space, with the property of blocking the air, but let light through. For this particular nature, in the Middle Ages was considered a magical material, which connected the visible and the invisible, the reality with the divine. The project is presented as a plexiglass cylinder of white color. When switched on a series of complex shapes move projected on the inner walls of the cylinder. Inside a mini computer controls an open-source electronic prototyping board, some motors and an array of led light, in a 3d printed moving structure. Music on video: John Hopkins. ← Animal Factory: ONE million views!! !